Your formula your way! Glytactin SWIRL is a powdered formula that can be mixed with 3-4 ounces cold water to make a creamy pudding or 6-8 ounces cold water to make a delicious shake/smoothie. SWIRL is a metabolic formula for ages one year and older for the dietary management of PKU. 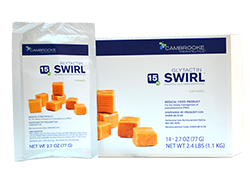 SWIRL comes in a great tasting caramelflavor and contains Glytactin, the proprietary, advanced formulation of glycomacropeptide and essential amino acids. SWIRL Caramel is for use in the dietary management of phenylketonuria in people age 1 and older. SWIRL is intended for adults and children who are under medical supervision for proven PKU. Protein in prescribed amounts must be supplemented to completely meet phenylalanine requirements. Work with your metabolic clinician to determine the daily protein intake (number of grams) you will use per day. Always use SWIRL as directed by your physician or dietitian. Sugar, whey protein isolate (milk), trehalose, non-dairy creamer (sunflower oil, corn syrup solids, food starch-modified, mono and diglycerides, natural flavor, citric acid, carrageenan), modified food starch, leucine, vitamin blend (calcium lactate, tricalcium phosphate, dipotassium phosphate, sodium chloride, magnesium phosphate, choline bitartrate, ascorbic acid, inositol, ferrous sulfate, niacinamide, zinc oxide, D-calcium pantothenate, vitamin B6 pyridoxine, manganese sulfate, riboflavin, thiamin mononitrate, copper gluconate, folic acid, potassium iodide, sodium selenite, vitamin K 1 phytonadione, sodium molybdate, chromium chloride, biotin, vitamin B12 cyanocobalamin, vitamin A palmitate, vitamin D3 cholecalciferol, vitamin E tocopheryl acetate), maltodextrine, tyrosine, arginine, histidine, DHA algal oil (glucose syrup solids, algal oil, mannitol, sodium caseinate [milk], soy protein, high oleic sunflower oil, sodium ascorbate, 2% or less: tricalcium phosphate, tetrasodium diphosphate, soy lecithin, mixed natural tocopherols and ascorbyl palmitate [as antioxidants]), natural and artificial flavors (food starch, modified food starch, maltodextrin, gum arabic, propylene glycol, dextrose, triacetin), tryptophan, methionine, probiotic (skim milk powder, Bacillus coagulans GBI-30 6086), natural color (fruit juice, water, maltodextrin). Contains corn, milk, soy.